We are pleased to announce Joan Elias as the recipient of the 2018 Karen Danielsen Outstanding Stewardship Award! Please join us in congratulating Joan and thanking her for her commitment to the organization and to area waterways. Joan was involved in the formation of the Bad River Watershed Association, serving on the first board of directors. 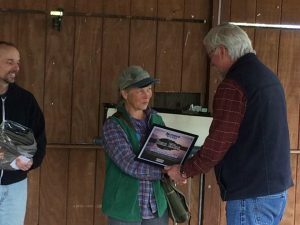 Her broad scientific knowledge base was crucial to our water quality programs, including the development of our Volunteer and Staff Quality Assurance Project Plan (QAPP) and Standard Operating Procedures (SOPs), the methods by which we collect data. Joan recently finished her second stint on the board, serving much of this as chair of the Program Committee. Also during this time, Joan was involved with the expansion of our service area around the region and choosing our new name. She continues to volunteer collecting data, assisting other volunteers with macroinvertebrate identification, and then checking these samples for accuracy before the data is recorded. Aside from her work with Superior Rivers, Joan helped with the efforts to establish a marine sanctuary in Lake Superior and is currently involved with the Wisconsin’s Green Fire group.